Business results from social media marketing are axiomatic. So, why is it that companies still don’t understand how imperative it is to do social media marketing correctly? Many companies are still failing at it, especially the B2B manufacturers with whom I speak every day. Many are failing to even lift their fingers when it comes to using Linkedin, Facebook, Twitter, Instagram, Youtube or any of the other social networks. But, here we are in 2017 and social media has taken over modern communication, both public 1:many and private 1:1 interaction. If Twitter is good enough for the office of the President of the United States, it should be good enough for your business. If you’re not posting updates on Linkedin, you’re not only hurting your marketing, but your probably not being seen by potential employees either. Don’t think these things matter to you? I predict you won’t be in business in ten years, unless you adapt to the newest form of 1:1 communication – more buyers prefer text and messaging apps over the telephone these days. Our buyers don’t use social media. Nobody shops for products like ours on Twitter. We need our employees talking to buyers, not wasting time on Facebook. People don’t go on Instagram to see what we do. It’s just travel and food pictures. But, all that’s crazy talk. These things are either not true or just lame excuses. Believing any of these excuses is like pretending rap music was never invented because you prefer the slower melodies of country. Plenty of people have proven the value of social for building businesses. If you’re a social hold-out, here’s 16 reasons you’re wrong. So, what’s the real reason companies aren’t jumping in head first? Your perceived risk: I can’t let my employees just say what they want to the world. My counter: You have your people speaking on the phone and sending emails, don’t you? You’re not controlling every word out of their mouth or every word they type, are you? No. Of course, you’re not. You trust them to use good judgment. Your perceived risk: What if an employee accidentally posts something after a few beers or before they’re fully awake? My counter: We can use software to make sure everything gets reviewed. We can make sure they’re using their work logins to administer accounts and not their personal ones, so there’s no risk of them publishing to the wrong account after a beer or two. The fact is that every aspect of business carries risk. Risk—as a reason for not using social media—is a red herring. Put a few guidelines in place and review them with your employees. If you need some help, read 7 Biggest Business & Legal Risks of B2B Social Media Marketing. There are at least 5 more risks you should plan to avoid. But, whatever you do, don’t continue sitting out of social because of these risks. Marketers deserve much of the blame for the disdain with which many B2B executives view social media. They’ve promulgated vapid “vanity” metrics such as follower and fan counts without correlating activities to impact. For my global manufacturing company clients, this is especially true. Executives at companies that make things are naturally skeptical of social fluffery. Rightfully or not, we scoff at the “social media culture” who tweet orders of their asinine sounding “coffee” drinks, incessantly post photos of themselves and get crack-like adrenaline rushes when they receive a Facebook notification. While we’re busy employing people and building seriously important things that make our world work, the narrative we hear is of an intemperate @RealDonaldTrump using Twitter for stream of consciousness updates; the Youtuber named PewDiePie with 50M followers who makes $15M per year recording himself playing video games; or an incompetent American Apparel whose history-deaf posting of the Challenger Shuttle explosion as a patriotic symbol made some of us indifferent to their recent closure. This type of social media drama is what justifies many company’s resistance and dismissal of social media among my crowd, even by a CEO who found me through a Google-indexed tweet a few weeks back. He conveniently blocked the tweet out of his memory when we began talking about his non-existent social presence. But, when I opened my website analytics and showed him how he found me and the path he took to eventually reach out to me, he still insisted that people like him and his clients don’t use social media. This attitude is prevalent. This CEO wasn’t much different than the VP of Sales who generated eight new leads when he shared a blog post on LinkedIn, but still couldn’t quite justify the time to nurture his LinkedIn presence on a weekly basis, at least until a few of those leads turned into customers. The key to overcoming skepticism is to show how social media marketing activities correlate to revenue. But, most social media marketers measure things that are hard to correlate to revenue, like impressions, likes, shares and retweets. While these metrics are good indicators of whether your messages are resonating with your audience, they aren’t great business value indicators. Instead, marketers need to track traffic from social and the leads, opportunities and revenue that that traffic generates. For many B2B companies who sell big ticket items and only close a few deals per quarter, it might be a while before social produces revenue. But, once it kicks in, prepare for more and more. The kryptonite to the typical B2B executive’s social media skepticism is data visualized. You’re busy, right? We get that. The reality is that an executive isn’t going to sit through a presentation of a thirty minute deck much less internalize every “meaningless” social marketing stat. The key to justifying social marketing effort and expense is to provide real-time dashboards that can be easily shared, reviewed and are automatically updated. 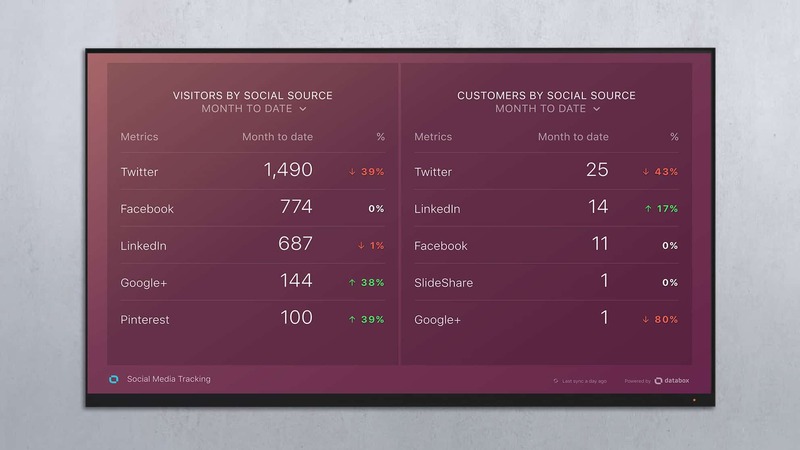 For example, the dashboard above is a simple dashboard that shows the impact of different social site on traffic and customer acquisition. 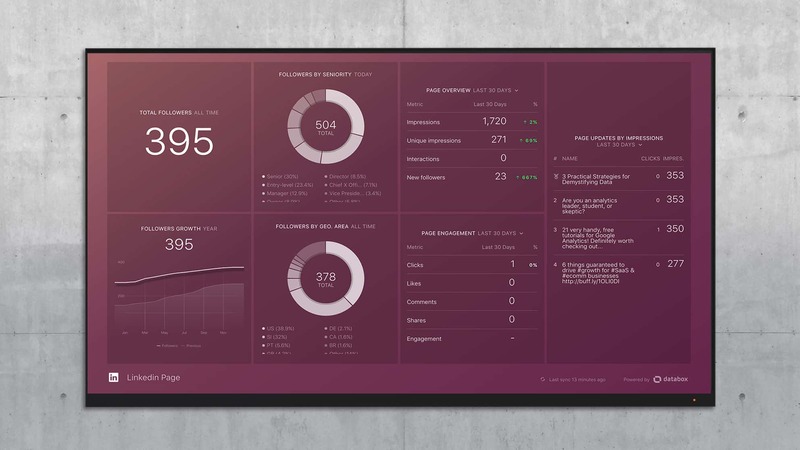 Show dashboards like this and executives will gradually get hooked on their own little crack hit of “engagement checking”. Too often, reporting gets delegated to an expensive analyst. Don’t make it the job of an analyst to pull together marketing reports. Hiring and paying an analyst for a job that can be automated by a marketer makes little sense. A pivot table or a regression analysis comes in handy once in awhile, but it’s not necessary most of the time. And the main problem with doing analysis in excel or some expensive, enterprise analytics package is that it’s out of date as soon as it’s published. Social is real time, so a static snapshot doesn’t quite do it justice. By the time an executive takes a look at it, the report is out of date. In other words – right idea, wrong execution. Reporting isn’t that difficult if you have the right tools in place. Aggregates data from disparate sources. Gives you out of the box reports depending on your data source. For example, if you use HubSpot (like my clients do), make sure your solution has HubSpot dashboards ready to go. Let’s you view data from one source next to another. For example, to track the impact of your Linkedin Company pages, you’ll want to show the volume of leads you get from Linkedin, which will be better tracked in an analytics tool like Google Analytics or HubSpot. But, you should visualize that next to the number of shares you got on Linkedin to show everyone the correlation between shares and leads. You might even want to plot Linkedin shares vs leads from Linkedin traffic on the same graph. Run calculations with data from different sources, like calculating the percentage of visitors from Linkedin that turn into clients. Track progress to goals, so you know if you’re on track to hitting your targets in a given week, month or quarter. Make sure the software lets you set goals. Show current performance versus historical performance, so you can ensure you’re always improving or at least not sliding backwards. Make your reports available on any device, anywhere. We check our email on our phones, why can’t we access our reports there too? With the right technology, monitoring social media marketing progress is easy. Oh and if you’re cutting and pasting marketing stats, stop it for goodness sake. If we redirected all of the effort marketers put into cutting and pasting data and graphs into powerpoint, our increased marketing output could increase manufacturing productivity by 10%, I bet. Once you’re automatically tracking your results in real-time, it’s time to integrate your social media marketing with the rest of your marketing strategy. In fact, the key to a successful social media strategy is a successful content marketing strategy. If you’re already doing content marketing, social media is a no brainer. Use social to amplify the reach of your message. If you’re not regularly producing helpful content, don’t expect your social media activities to produce much fruit. That’s silly, right? They aren’t the only ones. I have spoken to more than one company like this who has failed at social media and then used their own failures as proof that it won’t ever work for them. “We set up accounts and nothing came from it”, they say. Usually, I find their experiments are poorly designed and executed like the company’s above. To be successful, the key is to post information that your target buyer might find interesting, educational or humorous. Users don’t browse social media to find product information. (They still use Google for that.) But, they do follow suppliers who post interesting things relevant to their industry and their job. And of course, you should measure the messages that resonate best. Below is the templated report I’m using to measure progress with Linkedin Company Pages. Once the impact of social media on revenue is clear, and a content strategy is in place, exponential results can be achieved when everyone in your company gets involved. 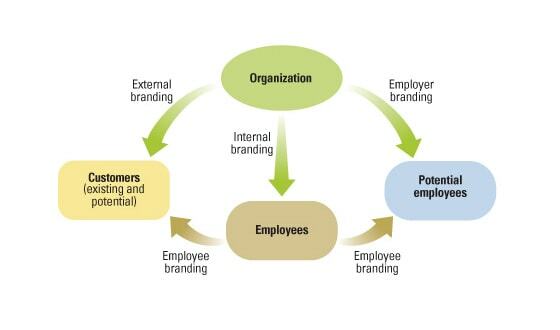 Employees actively engaged as brand/company advocates can amplify a company’s reach and engagement levels. Employees who aren’t is potentially worse than neutral as it can be perceived as “damning by faint praise”. The article looks extensively into perceived risks, value of employee branding, platforms, guidelines and techniques to foster engagement. In my experience, one simple opportunity that’s often poorly developed is employee sharing of content. There are tools to support this process that make it easy and automatic, like publishing to employee social profiles via HubSpot’s social publishing tool when new content is published to the website or scheduling multiple social media updates at once via tools like GaggleAmp. There are also more advanced methods of leveraging social media like automatically notifying your sales people when there’s an opportunity for them to interact with one of their target prospects on social media. There’s one final barrier to success; one which will trump all of the progress which data insights can inform. Executive behaviors will speak far louder than their memos and speeches. In order for social media to drive revenue, executives must personally participate. A single dismissive remark from an executive about social media will undo months of internal selling. And the corollary is that executives must engage in social consistently for months, and demonstrate the results to their teams in order to effectively overcome hesitancy and skepticism among staff. Social media isn’t going away. There were 2.3+ billion active social media users last year and that number grew 10% from the year before. Some of them are your customers, or should be your customers. So, get started before you’re the last to the party. Run experiments, tie them to your overall marketing and sales strategy and get everyone involved – especially your executives. And whatever you do, use data to adapt your approach. Measure the impact on revenue of every social media marketing activity. Then do more of what works. You can’t tap the real potential of social media without clear data that provides compelling justification for doing so. That means that company social accounts will be under utilized and the reach of employees will be neglected. Both are a costly business blunder – so solve the data challenge and then start building impactful social media programs. Ed Marsh founded and runs Consilium.